My mom moved into Pacifica Senior Living South, and Im finding the care at par with everybody else. Shes in level 2 care. Its not too much, and thats enough for her. I liked that its a little smaller, and by having 80 residents there, its nicer for her. The staff is good. They keep her very clean, they take care of her room every week, and its very nice. Shes actually going out and doing things. Feb 25, 2019 | Reviewed by K.S. I looked at the rooms, and even though they're supposed to be remodeled, they still looked old to me. I understand that the cost of a remodel is expensive, but they just still look old. The room that I saw had nothing in it, so it was kind of hard to envision what it could really be. I was told I would have a meal during the tour, but I didn't have one. The director or the person that was in charge called to invite me for lunch there. The food is comparable to another community. I have eaten it, its cafeteria food, and definitely not five-star, but decent. The food is like stuff they give to kids in school, like chicken nuggets, but I had their beef stir fry, and the soup was good. Everything was already prepared because they bring the meals in frozen, then they heat it and serve it. I didn't see any activities. The people that are there need assistance in some way, whether it's for medication or full-time care. So you wouldn't have the same type of activities as independent living. They have assisted living and also skilled nursing. The staff member showed me the other part of the community for skilled nursing. They have a very small library, a small TV room that's includes the library, and they have an activity room, but the door was closed. It's relatively a small place. The food was OK. It's what I would call a belly-filler. The staff was very nice, pleasant, and cordial. The building itself didn't smell and I was told that it's recently been renovated, but it didn't look like a five-star place. When you walk into the reception area it should have more colors. They need more colors for it to be welcoming. They don't have to put expensive stuff in there, just some color. They also have parking, which is on a first-come-first serve basis. They have a beauty salon and a nurse. Pacifica Senior Living South Coast was wonderful. We met people who lived there and it was very good. There were good-sized rooms and bathrooms and adequate living/bedroom areas. They had an activity room and a calendar of events. They served three meals and it seemed pretty flexible and accommodating. We had an excellent meal. The staff was wonderful, warm, informational and answered any questions we had. We visited Pacifica Senior Living South Coast for my father. The facilities there would have been a better fit for him, but it really came down to the economics. They had both assisted living and memory care. The rooms were recently upgraded. The place overall was larger and a little bit more modern; I understand it went through a massive renovation. It's a beautiful community. They had a computer center and a library, but I didn't really witness any activities while I was there. On my first impression, I actually wanted to place my father there. Everything I've witnessed was very well-kept. I met the manager, who was brilliant; it was lovely to meet her. She addressed every question I had, so she's fantastic. Pacifica Senior Living South Coast was wonderful. I liked it. It's nice for seniors. It was clean and it seemed like a comfortable place. The residents looked very comfortable. They were sitting around the tables in the dining area and playing games. The staff was very nice to my neighbor. The tour she gave us was very nice. She was very polite, very thoughtful, very helpful, and answered all of her questions. We chose Pacifica Senior Living South Coast for my mother, but she hasn't moved in yet. We were happy with the facility's location, what the rooms looked like, the cleanliness, the friendliness of the people, the services that they offered, and the activities that they provided. They change the activities based upon the residents' desires. They have bingo, the usual things, and activities off-site, but it was the flexibility that we liked. The room was very spacious and a good size. The shower area was standard and pre-built walk-in, so my mother would be able to walk into the shower. The room we have chosen has a nice, walk-in closet. The room was light and airy. My mother was at Pacifica Senior Living South Coast for about 4-1/2 weeks just for atrophy care. She got really sick and she couldn't really get up or walk. The place was clean. They're extremely helpful. All you have to do is ask and you get what you want. The staff was very good. They make sure that you have what you need and if you don't, they get it as soon as possible, so they're timely. They were able to get my mom to some doctors' appointments, which really helped. On Mondays and Wednesdays, they take residents to their doctors' appointments and if they're in a wheelchair, that really helps. The rooms were beautiful, they all had TVs and refrigerators. You can either share a room or have a room alone, which is nice. There is a bathroom connected to the room, there's a shower, and they help with showers, which is important for my mom because she has a hard time with that. You can bring in anything you want (like pictures) and I brought plants in. You can make it like a bedroom. A couple other women had their rooms done and they were really cute. They have puzzles. If they don't want to eat in their room, they can go out and eat in the dining room. They have activities. We've chosen Pacifica Senior Living South Coast for my father. The rooms are very nice. They have a variety of things. I haven't looked at all of it because they were just remodeling and reopening the place. They have exercises, sing-along, game nights, and different things. The dining area is very nice, roomy, and has a lot of tables that sit four to each. I saw a library, a very nice sitting room with reclining chairs, a small TV area, and another area where someone could sit down and play some cards. They have a nice outside patio. The staff is very friendly. Villa Rosa is an exclusive memory care community designed to meet the needs of memory impaired. Frontier Management recently took over the community and manage 60+ other communities in 8 states. The community is beautifully decorated and has a warm inviting feel as everyone knows your name. The chef has some tenure and makes delicious meals that make you feel right at home. Brownies are the chef's specialty, so be sure to grab one in the lobby while you are there. There has been some staff turnover, but the sales staff are first class. They go out of their way to meet the needs of their residents. The best way to get to know a community is by scheduling a tour. 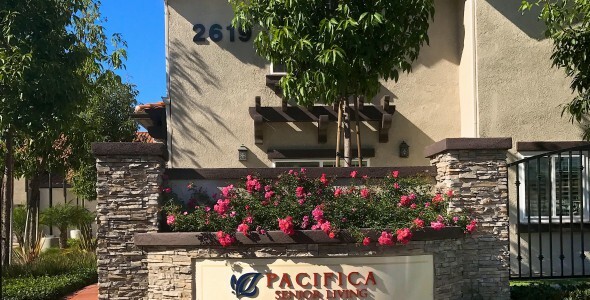 See the facilities, meet the staff and residents, and get a feel first hand what it's like to live at Pacifica Senior Living South Coast Assisted Living. A warm and friendly assisted living community in Orange County is Pacifica Senior Living South Coast. Conveniently near hospitals, medical facilities, South Coast Plaza Shopping Mall, Back Bay Nature Preserve, Newport Beach, dining and theater. Here residents receive compassionate care, dignity and respect that they deserve. Pacifica Senior Living South Coast strives to create a lifestyle of independence, security and peace of mind for each individual and their family. We do what we love and what we truly believe in – provide compassionate, personalized care services that ensure dignity and respect. Our dedicated, professional team supports each resident and goes above and beyond to help them feel at home. In our community residents receive balance level of support and independence. Homes are specially designed to provide comfort and easy mobility. Available in companion suites and studio apartments that comes with own private bathroom, climate control and spacious closets. Here residents can remain independent and remain safe. Our community is specially designed for senior living. We have a patio and a garden where residents can take a stroll to exercise while enjoying the beauty of nature. Our living area is truly inviting and has comfortable couches where residents can lounge while reading. Our staff are available 24 hours a day and provides each residents customized care plan to suit their needs. We provide medication management, personal care and assistance to daily activities. We also have monitored emergency call services so we could immediately attend to our residents need. We have planned daily activities that residents can join at their own liking. Here residents can enjoy the luxury of a home less the chores that comes with it. We take care of the housekeeping, laundry and maintenance. We also have transportation services to take residents to their medical appointment or go shopping.